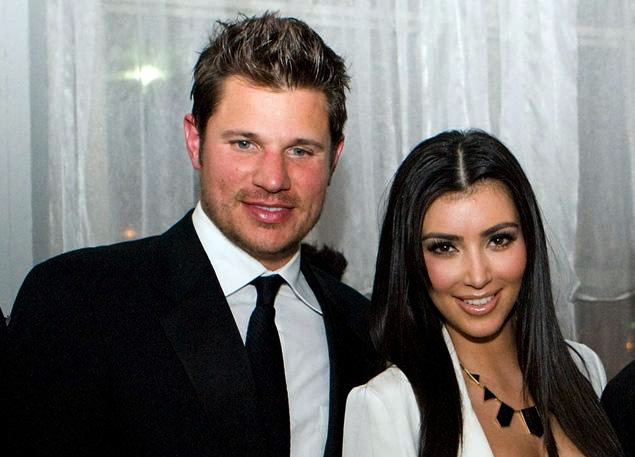 Remember when Kim Kardashian and Nick Lachey dated? Yeah, nobody else really does either, but they did, for a brief time in 2006. And even back then, Kimmy was nuts for any and all kinds of publicity. Kim and Nick hooked up for a little while shortly after Nick split from his wife, Jessica Simpson. And now, he’s spilling the beans, implying that even back then, Kim was a total fame freak. First of all, the idea of Kim Kardashian dating a boy-band member (former member or not), seems almost absurd and way out of her norm. But date she did, and according to former 98 Degrees band member Nick Lachey, not only did she *not* try to avoid the paparazzi, she called them. Yes, Lachey claims in a new interview in ‘Details’ magazine that Kim was so hip to get the photographers, she phoned them to let them know where to find them (at the movies, if you’re wondering). It sure was. The rest, as they say, is history: Nick Lachey went on to date and eventually marry Vanessa Minnillo, while Kim dated Reggie Bush, married Kris Humphries for 72 days and is now expecting Kanye West’s baby. Really, nothing more needs to be said, now does it?